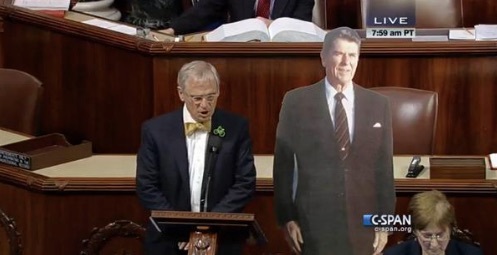 A handful of House Democrats, led by the egregious Oregon Rep. Earl Blumenauer, have conducted a stunt of bringing a cardboard cutout of Ronald Reagan to the House floor to bolster their case for raising the federal gasoline tax, because falling gasoline prices are simply unbearable if you’re a liberal. “All it takes is a little leadership and courage, like Ronald Reagan and [House Speaker] Tip O’Neill did 32 years ago,” Blumenauer said. Some other time I’ll explain to Blumenauer and other liberals Reagan’s grasp of why not all taxes are created equal, and consequently why he refused to consider raising income tax rates again after they passed in 1981, which is what Democrats (and some weak-minded Republicans like Dole and Domenici) wanted more than anything. But if House Republicans want to have fun with this, they should respond by bringing a cardboard cutout of Bill Clinton to the House floor, and remind Democrats that Clinton worked with the GOP Congress to cut the capital gains tax. Heck, I might be willing to trade a gas tax increase for a cut in the capital gains tax. All it takes is a little leadership, like Bill Clinton and Newt Gingrich did 16 years ago! P.S. It might be fun for a reporter to ask Hillary Clinton if she agreed with her husband’s decision to cut the capital gains tax. Fun time ahead!